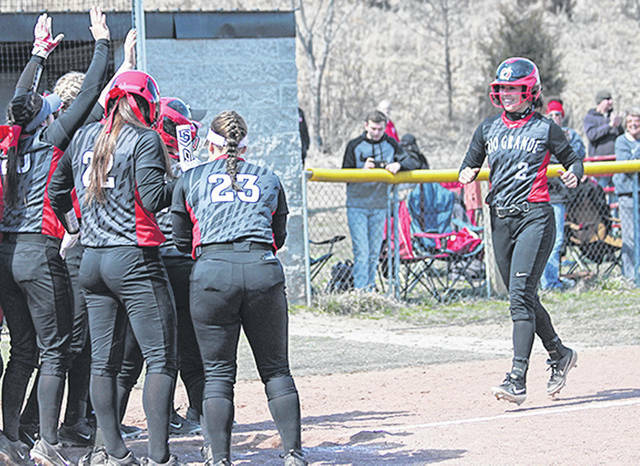 Rio Grande’s Kenzie Cremeens (2) is greeted at home plate by her teammates after connecting on one of her two home runs in Saturday’s game one win over Midway University at Rio Softball Park. The RedStorm swept the twinbill by scores of 8-0 and 14-2. RIO GRANDE, Ohio — After taking down one convocation of Eagles in their home opener on Friday, the University of Rio Grande reloaded its guns less than 24 hours later seeking another bountiful harvest. The RedStorm handed Midway University a pair of mercy rule-shortened losses, blasting the Eagles by scores of 8-0 and 14-2 in a pair of five-inning contests, Saturday afternoon, in River States Conference softball action at Rio Softball Park. Rio Grande improved to 12-8 overall and 4-0 in league play with the doubleheader sweep. Midway dropped to 8-10 overall and 2-2 in the RSC. Freshman Kenzie Cremeens (Ironton, OH) starred for Rio Grande in the opener, going 3-for-3 with a pair of home runs and a double. She had two-run home runs in both the first and fourth innings. Junior Michaela Criner (Bremen, OH) and freshman Taylor Webb (Willow Wood, OH) both added two hits and an RBI of their own, while seniors Kelsey Conkey (Minford, OH) and Carly Skeese (Newark, OH) both doubled. Conkey also had a run batted in. In the pitcher’s circle, Conkey had, arguably, her best performance of the season. The right-hander scattered three hits – all singles – and struck out four en route to her fourth win in six decisions. Mallory Kruzich (2-4) started and took the loss for Midway, allowing seven hits and five runs in just 2-2/3 innings. Carson Flynn was 2-for-2 in a losing cause for the Eagles. In the nightcap, Rio Grande grabbed a 2-0 first inning lead before lowering the boom with six runs in the second inning and five runs in the third. Conkey went 3-for-3 and drove in four runs, while sophomore Aubrey Azbill (Miamisburg, OH) went 3-for-3 with three RBI and junior Brooke Hoffman (Columbus Grove, OH) finished 4-for-4 with four runs scored. Conkey had a two-run double in the six-run second and an RBI hit in the five-run third, while Azbill gave Rio its first inning lead with a two-run single. Junior Lexi Philen (Tallmadge, OH) finished 2-for-2 and drove in a run, while Skeese and sophomore Kayla Slutz (Navarre, OH) drove in two runs each. Skeese and Webb also doubled in the win. Sophomore Raelynn Hastings (Commercial Point, OH) earned her seventh win in 11 decisions, allowing five hits and a run over four innings. Jenna Stiles started and lost for Midway, allowing six hits, five walks and eight runs in just 1-1/3 innings. Baylee Woods went 2-for-3 with a double and a run batted in for the Eagles, while Dee Lewis added a double. Rio Grande is scheduled to return to action on Wednesday when it hosts the University of Northwestern Ohio in a non-conference twin bill.